I’m no prude when it comes to toners. On any given morning, noon or evening, you can find me spritzing away a good 4, 5 or 6 times to give my face an even mist of moisture to either prep or rejuvenate my skin. 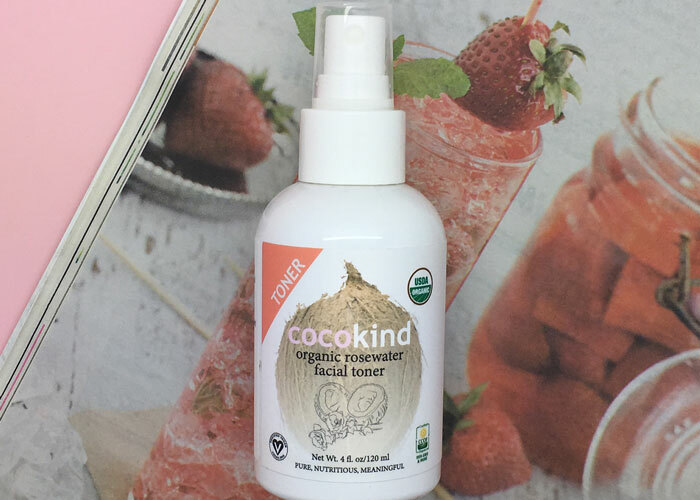 With Cocokind’s one-ingredient facial toner, it’s something more like 10 spritzes. It’s just that good. So let’s repeat. Cocokind, a new-to-me green beauty brand that seemed to come out of nowhere (where the hell have I been? ), has a one-ingredient hydrating toner that has me paying attention. It’s a bottle of freakin’ USDA certified organic rose hydrosol. I’m just typically not that impressed by one-ingredient hydrosols. Especially rosewater. It’s “boring” and pretty easy to find anywhere. But this stuff is different. Cocokind’s lightweight, No. 1 plastic bottle disperses an extremely even mist of pure, beautiful rose hydrosol that makes my skin feel soft and refreshed and my mind feel calm and at ease. I’ve said it once, and I’ll say it again, but hydrating toners are useless without a proper misting bottle. When it comes to toners, I’ll take easy-to-recycle, plain white plastic bottles over fancy, stopped-up violet glass sprays any day. Rant over. Back to Cocokind and its wonderfully pleasing product. Rose — unadultered, beautiful rose — has grown on my senses so much over the past few years. Cocokind’s Organic Rosewater Facial Toner captures the most pure essence of rose that I have ever experienced from a bottle. You can easily use this hydrating toner as a skin treatment or as aromatherapy — or as both. Keep it on your nightstand and spray away before bed. You’ll instantly relax. Thanks, beautiful rose. Beyond the actual ingredient inside, Cocokind sets itself apart by offering a feminine yet understated design on its packaging. While I know that really doesn’t matter when it comes down to skincare, thoughtful branding still goes a long way. Speaking of going a long way, Cocokind as a company operates with philanthropy in mind. As a socially conscious brand, Cocokind donates proceeds to give clean water, food and education to children in need. So, do you need this rose hydrosol? I’d say so. If you’re looking for simple, streamlined, certified organic skincare, Cocokind has you covered. At $16.99 a bottle, Cocokind’s Organic Rosewater Facial Toner is the most expensive product in the 20-something single product collection. That means you can stock up or try as much as you want without breaking the bank. I know I’ll be repurchasing this very soon (because 10 spritzes at a time at all hours of a day really adds up!). What are your thoughts on minimal ingredient products? Do you use rosewater or other hydrosols? Have you tried anything from Cocokind? Tell me in the comments!